Developer section of the first Augmented Reality game publishing platform was released for all Unity game developers. We call all developers to join our growing community and let their 3D games provide next level gaming experience. Go to developer section at http://developer.livegameboard.com/ and grab the Unity Ligabo SDK. Camera control and game view. Player can control view of the game by simply holding a device and moving it closer or around live game board. This gives player very natural and easy constant game view change. Player is not required to zoom or rotate game scene by finger gestures so is not being distracted from playing. However the game must be viewable from any angle and from any distance in order to use augmented reality game view. Merging real world with virtual content. Combining 2 worlds is always amazing for people when they see it. The feeling of playing the game in your real life is totally unique and can give your game a lot of shine. You can lay down games like Angry birds or Racing directly on the floor in player's room. Virtual reality. Augmented reality also sometimes called blended reality is combination of real world and virtual content. Virtual reality does not show real world but smoothly moving from Augmented reality into virtual reality is very interesting in some cases. Imaging you have got a village with houses and mines etc. In augmented reality you can lay down the village to player table and let him to interact with it. At some stage you can transit user down inside the house and use virtual reality to let him to see and carry on part of the game inside building. 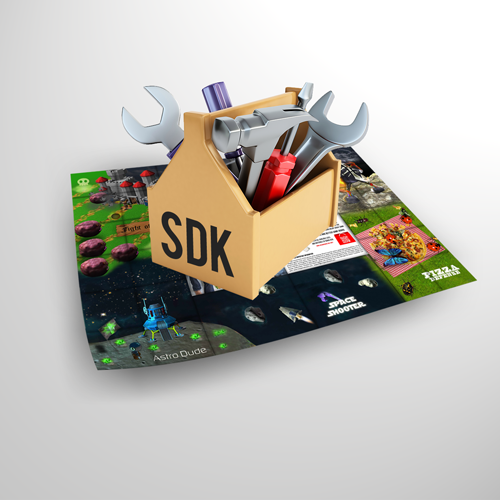 Apart from SDK which helps developers to quickly add AR game mode into their existing game, there is plenty of other useful information. Tutorials that explain how to implement control modes for best AR gaming experience. Documentation and api reference. We can't wait to see all great ideas visualized in AR on Live Game Board.